USS Midway Museum at the Navy Pier in San Diego Bay, 910 N. Harbor Dr., downtown (619-544-9600) [midway.org]. 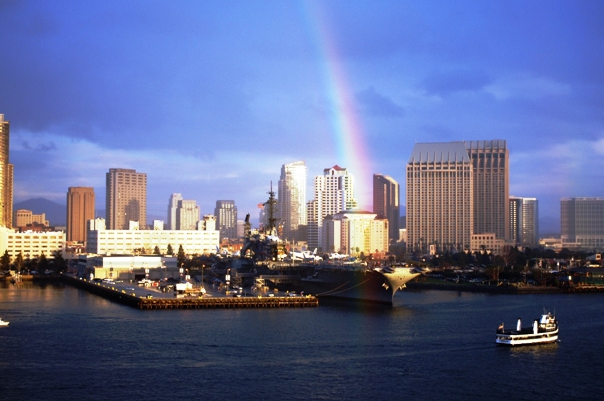 Experience the magic aboard one of the longest-serving aircraft carriers in U.S. 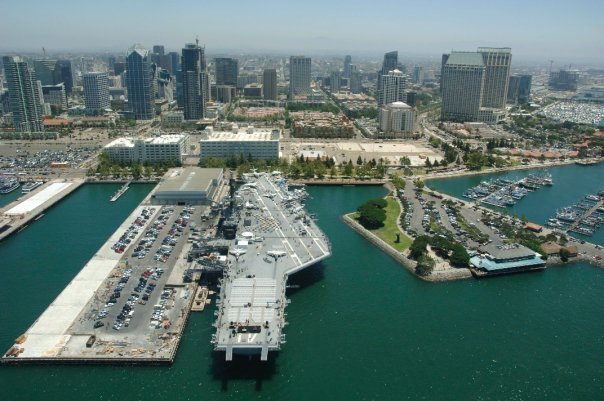 Naval history, the USS Midway. 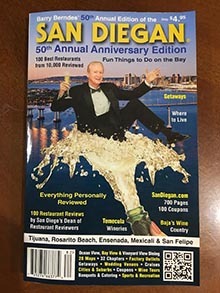 It’s a must-see San Diego attraction. The tour lasts 3–4 hours and is included with admission. 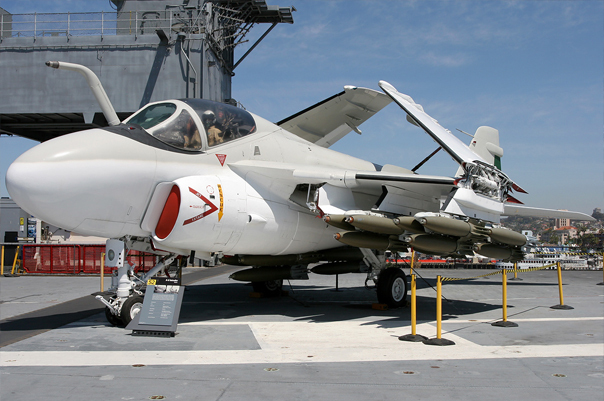 You can launch, fly dogfight missions and land aboard the carrier via optional flight simulators. Also available are ­educational programs including an award-winning children’s audio tour, a new self-guided tour just for kids, group tours and limited wheelchair accessibility. Limited paid parking on Navy Pier ($7–$10). Open daily 10 a.m.–5 p.m.; ticket booth closes at 4 p.m. Closed Thanksgiving and Christmas. Admission is ($20) for adults; ($17) for seniors 62 and over; ($10) for retired military; ($15) for students ages 13-17 or with valid college ID; ($10) for youth ages 6–12; and no charge for children 5 and under and active-duty personnel with valid ID. Online ticket prices are less, be sure to use their discount coupon for a free youth admission with one or more paying adult. Credit cards: MC, VISA. 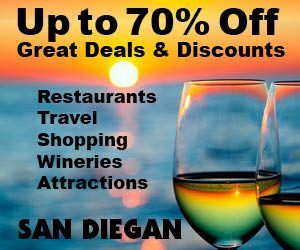 Be sure to use their discount coupon in the SAN DIEGAN or online for a free youth admittance with paid adult up to 4 persons. This is a saving of up to ($36). Once on board, you can enjoy a self-guided audio tour and see more than 35 exhibits and displays encompassing 4.02 acres. 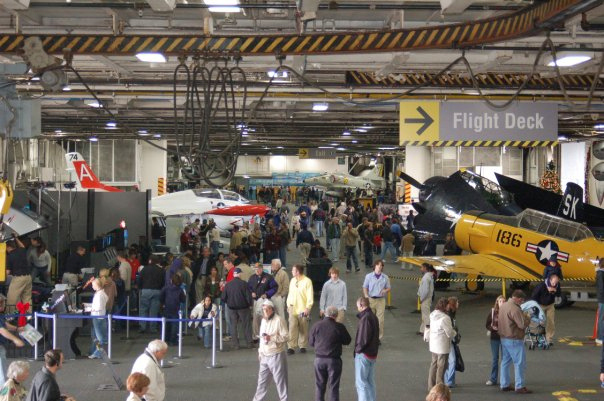 These include the galley, berthing spaces, sick bay, flight deck, restored aircraft and more. This fascinating aircraft tour lasts 3–4 hours and is included with your admission. 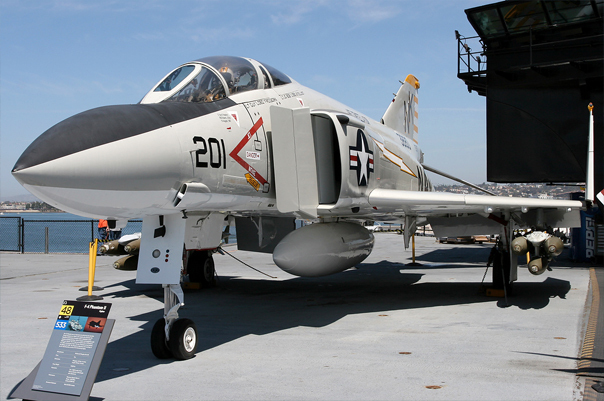 You can even launch a play, fly dogfight missions and land aboard the USS Midway Aircraft carrier via their optional flight simulators. Also available are educational programs including an award-winning children’s audio tour. Plus, there are group tours and limited wheelchair accessibility. 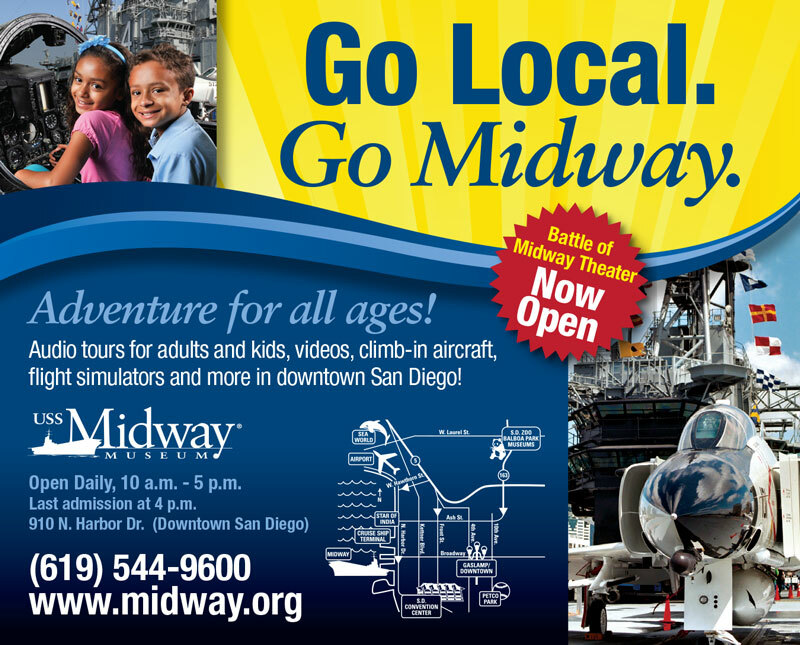 Be sure to stop by the gift shop and café before concluding your tour of the USS Midway. There is limited paid parking available on the Navy Pier next to the ship ($5–$10). 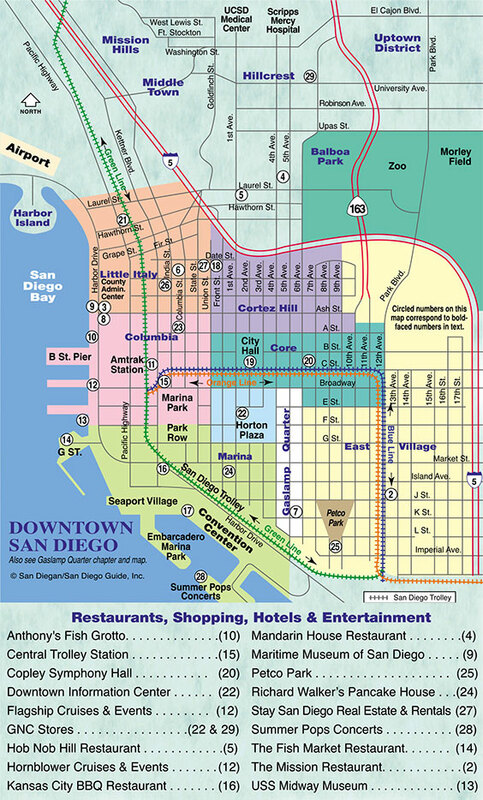 On the other hand, there is amply parking all along the waterfront including at Seaport Village and at the San Diego Civic Center at the corner of Ash Street and Harbor Drive. And once you there, you will want to see everything there is to see and dine at one of the numerous waterfront Restaurants. Become a member for free admission and other perks. 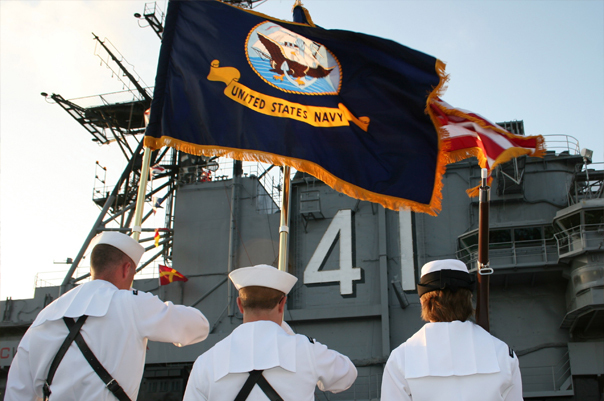 The USS Midway Museum is an immensely popular event venue. Its unique downtown location, convention center proximity and 360-degree panorama view make it an unparalleled venue for every occasion. The Midway can accommodate events for up to 3,500 guests.